You will notice two spikes in the trend graph, one in mid-February, and another in early April. What Google is sort of downplaying as just an “update” to social search, is actually much more. Google is taking those social circle links at the bottom of the page, pumping them with social steroids, and shoving them towards the top of results pages. For the first time, social is actually going to affect Google Search in a meaningful way. In early-April, Google announced its +1 button to rival Facebook’s Like button. I wrote about this in this earlier post on Social Search and Google +1. 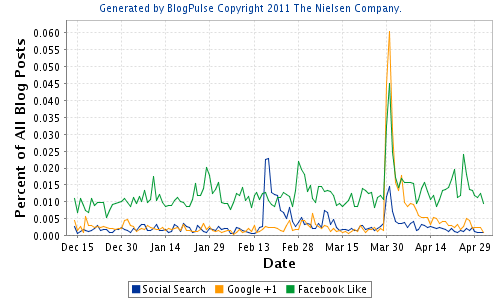 … Google has demonstrated that they consider social signals as an important element of their ranking of search results. So, does the Google +1 launch officially make Google a social search engine? After a long lull in “social search” buzz, we hear two big announcements related to social search in the span of two months in 2011 from Google. What does this mean for “social search”? It will be fair to say that “social search” is a real phenomenon, and is rapidly evolving. October 2010, Lauren Fisher, TNW Social Media: The Evolution of Social Search – Lauren wrote about the potential business impacts of the emerging social search phenomena. Among the observations Lauren makes is this: “The impact that social search can have on the SEO industry is huge, and it represents a fundamental shift in the way this operates. While SEO has typically been a longer-term strategy, often taking weeks of months to see the fruits of your labour, social search has changed all that.”, and clearly, we are seeing signs in the SEO market that the impact of social on search is a key part of modern SEO work. Social search, as we now know it, becomes a mainstream search engine feature: It is evident that Google is fully integrating social signals to alter their search results ranking. We can only expect this integration to go broader (more social signals) and deeper (better integration of social signals). This will drive a flurry of interest and activity on the part of companies and content creators to learn and incorporate “social search” related elements in their own online content and marketing strategies. Aggregate social signals will continue to impact search result ranking: I think that using aggregate social signals to alter search result ranking is an idea that is here to stay – this is what Zakta.com does, and the reason for this is that this can be done in a way where the value can be delivered without getting destroyed by privacy issues or spam issues. Privacy concerns will hamper broad adoption: I think that a large percentage of users are going to be concerned in opening up their social circles and content flows from within them to mainstream search engines. In turn, this will be a hurdle for broad adoption of social circles into search. Facebook social search will be here: Social search won’t remain just in the bastion of search engines. Facebook will be a huge player in this. As I see it, Facebook has at least two major assets as it pertains to social search: (1) a growing base of registered users with their growing social graphs, and (2) an enormous growing set of social signals fueled through a lot of social sharing within Facebook, their seemingly ubiquitous Facebook Like button, and new social sharing widgets they are deploying in the market. How long before we see an innovative “social search” tool from Facebook that leverages all these massive assets they have! Social search startups will innovate along different paths: Social search is a buzzword that has meant the incorporation of social search signals in search results. But that is a rather limiting view of what can be possible when social and search are combined. I think we can expect new solutions to enter the market that will vastly expand the definition and understanding of social search in the coming months and years. I think that social search startups will innovate along different paths not taken by mainstream search engines so far. Curation: I think that personal and social curation of search results is key to delivering relevance and ongoing value for informational searches. Collaboration: I think that real-time and asynchronous collaboration between trusted people (social circle / professional circle) is key to leveraging group knowledge and work as it pertains to informational searching and Web-based information research. Zakta’s new service, SearchTeam, is a real-time collaborative search and curation engine that is based on the principles of curation and collaboration applied to the context of the informational search process / information research. SearchTeam is not officially launched yet, but you can try it out today at SearchTeam.com. What do you think about social search and where it is going?